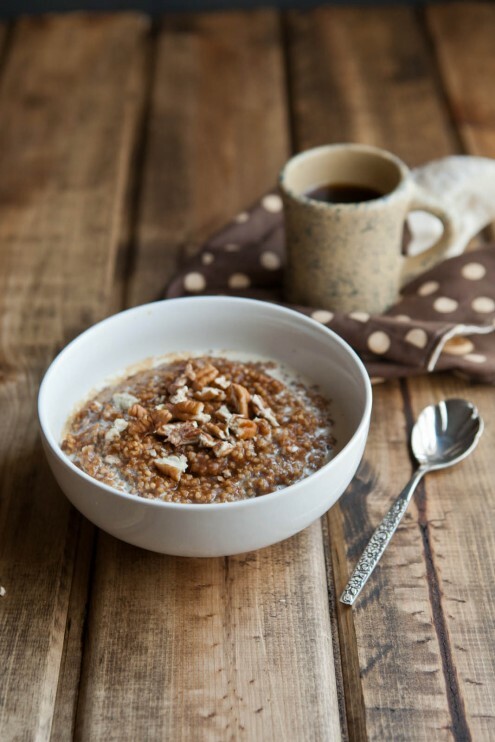 Pumpkin Pie Millet Porridge | Naturally. I had an “oh right” moment this morning. My dog and I are currently sitting on a front porch, overlooking a lake, with only the sounds of birds to keep us company. I’m out of cellphone reception and I’m 15 minutes from town. I didn’t realize, but I needed this. Yet this morning was a precious reminder that sometimes life is better experienced, living in the moment. I stood, watched the sunrise, took a deep breathe, and then continued on my hike. It was one of those “you had to be there” moments. A good for the soul moment. Combine millet, water, pumpkin, and spices together in a sauce pan. Stir and bring to a boil the cover and reduce down to a simmer. Let cook for 20-30 minutes until millet is cooked and tender. Stir and check occasionally while cooking, adding extra water as needed. It’s all about the kind of texture and consistency you want. When almost done, add a bit of maple syrup and taste. Start on the low end (a teaspoon or two) and continue until you’ve reached a desired sweetness. This looks so healthy! Love this idea! Like you, I don’t eat millet nearly as often as I should. Breakfast seems like a good segue for change. And also like you, Im really savoring those totally-beautiful-no-camera-just-enjoy moments too. Looks so hearty. 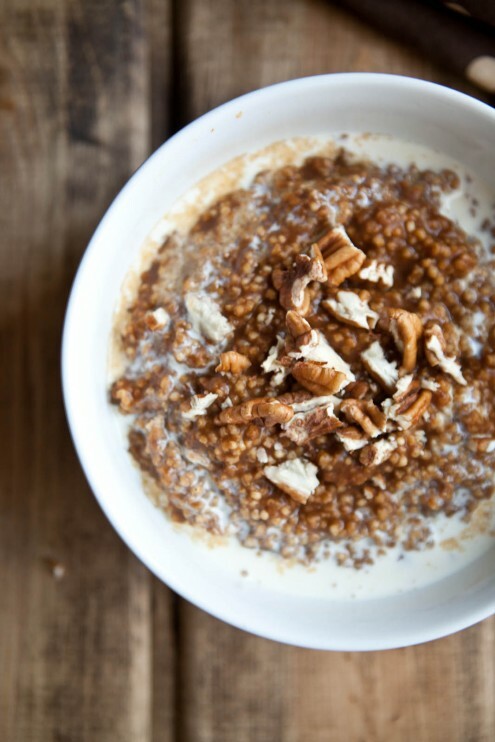 I am trying to eat more healthy grains, would love to try this recipe! It’s really nice- sometimes I don’t think my parents know how lucky they are! Amazing! I can’t wait to make this for breakfast this week! Thank you! I’ve been spending a lot of time playing with light- it’s so much fun! Sounds like an incredible morning! And I know what you mean about being behind the camera, and sometimes being glad that you’ve forgotten it so you can just experience the moment. 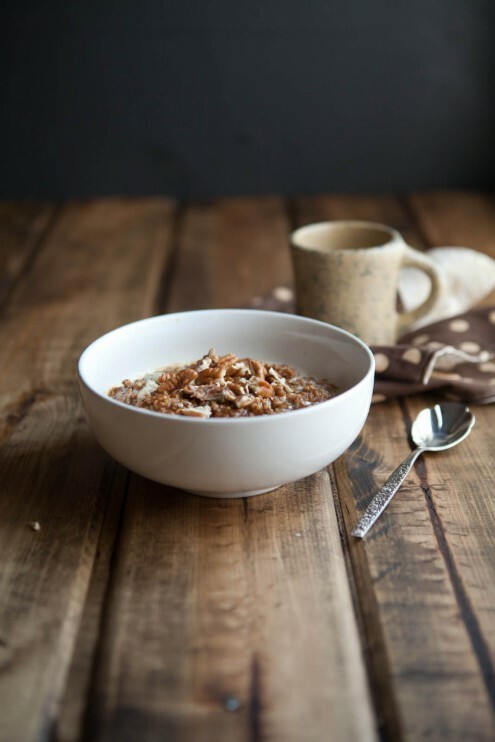 This porridge sounds like the ultimate breakfast. I really think there should be more times when I forget my camera! Wow, this is truly beautiful. I admit that millet has been on my to-make list for ages now, and yet I still haven’t gotten around to it. This decadent porridge has just given me every reason to try it, stat. I have been hooked on millet ever since making Heidi Swanson’s millet muffins. I am so excited to try this and to have another millet recipe in my repertoire. Thanks for sharing! Arrhh! This looks delish. I’ve got a whole bunch of millet in the pantry that I’ve been wondering what to do with… looks like I’ve found the perfect solution!! I have been doing something very similar with cream of wheat and other hot grains when I received a surplus of canned pumpkin. here’s a tip: stir in a spoonful of peanut butter for a little protein boost. peanut butter +pumpkin+maple=awesomeness! is it possible to do this recipe with precooked millet? I made a giant batch of it to last me the week. thanks! Hmm- I’ve never tried. It really relies on the millet soaking up the pumpkin puree while it cooks! I have only made millet once in a savory dish, so I’m not very familiar with it. I am usually rushing through my mornings and this seems like it takes a bit of time and attention. Would this be something I could make the night before and then reheat on the stove for breakfast or would the texture be weird? I will definitely try this on the weekends though! Sounds delish! I’ve never tried to make this ahead of time- it might work, but I wonder if the texture would be softer? If you decide to try- please let me know! I found the combination of cinnamon, ginger, and nutmeg to be too much; only a pinch of nutmeg would have sufficed (a little goes a long way). Fresh ginger, too, would perhaps have been more flavorful. Good idea, but too overpowered by spices for me.